Dorothy Meets The Scarecrow. dorothy meets the scarecrow. Wallpaper and background images in the The Wizard of Oz club tagged: dorothy scarecrow wizard of oz image photo. This The Wizard of Oz photo might contain surcoat and سورکوت. Awww,Iv'e just spotted little toto ! 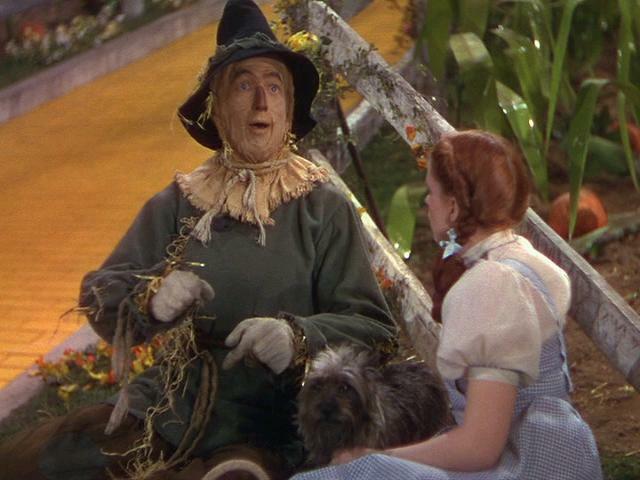 I love the scarecrow, he's my favourite character after Dorothy. He's so goofy but kind-hearted. A also love the song he sings "If I Only Had A Brain" ... I think I can associate with that song!!! Lol ! I can associate with him too,I think i'm a bit brainless not saving my images ! But he did get a Diploma and so did i yay ! I didn't. I rest my case regarding my comment! Awww no,I won't hear that you don't have a brain,You are very talented,creative,thoughtful,and dedicted all rare qualities OK !! And much more ! Oh what the heck, who needs brains then with all those other qualities?! You always make me smile, Berni! You have brains as well ! !You need brains to have all those qualities !!! my stepdad and I are scarecrow and Dorothy because my stepdad nice kind and love me my mother and my brother.